Zero Tolerance, often referred to as ZT for short first came about in 2006 when it debuted many of the hard use folding knives and combat knives that we know today. 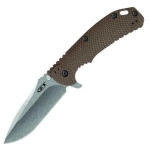 ZT prides itself on its made in the USA knives ideally suited for military, law enforcement, and emergency personnel. The large and heavy nature of the knives also makes them ideal knives for camping tasks such as building shelter, hunting tasks such as skinning, survival techniques such as fire building, and general every day carry use. If you are looking for a tough knife that is built like a tank, Zero Tolerance is a great place to start. Below is a chart showing the best Zero Tolerance knives on the site as reviewed by multiple users. Keep in mind that there are many great Zero Tolerance knives out there, but if you can't decide on one after searching the site, choose one off this list and we are confident that you will be happy!